Taxibot plans to have its almost-autonomous tug in service this year. Three companies are competing to offer airlines a fuel-saving way to have their aircraft taxi with engines shut down. WheelTug, Israel Aerospace Industries (IAI, Booth P39) and EGTS International–a joint venture between Safran (Booth G16) and Honeywell (Booth Q23)–are developing systems that are either on-board or external and that aim to make the aircraft autonomous on the ground, without using its turbofans. Entry into service should take place between this year and 2016. 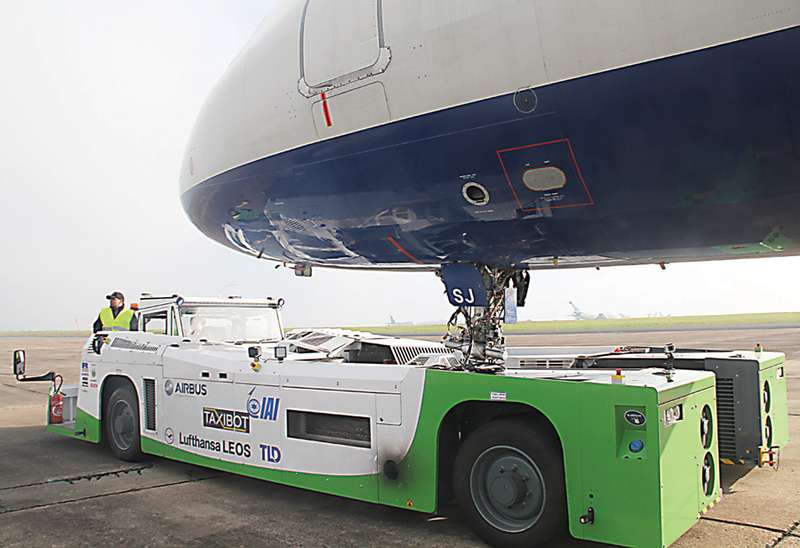 The three companies have chosen different solutions: Gibraltar, UK-based WheelTug is installing its system on the nosewheel; while EGTS International is installing its electric green taxiing system (EGTS) on the main landing gear; and IAI, partnering with global ground-support equipment manufacturer TLD (headquartered in Rungis, France), has chosen an autonomous vehicle that can tow the aircraft from the gate to the runway threshold and back. “The benefit of our EGTS is permanent for the operator, as it is an on-board system. In addition, placing it on the main landing gear provides optimal traction,” Frédéric Crancée, Safran’s v-p sales and marketing for the EGTS, told AIN. He added that it involves no modification of the landing gear itself. The WheelTug system does involve some modification, albeit limited, according to its promoters. CEO Isaiah Cox emphasized that this technology is not aimed at high performance or maximal capability but rather a cheaper, lighter alternative devised to maximize the airline’s revenues. WheelTug will allow only slow ground speeds: 7 to 10 knots. On relatively rare occasions, such as on a slippery taxiway when the aircraft has an aft center of gravity, it will be useless, he said. “But our lease-only business model means that it will cost airlines nothing to install, with the airline keeping 50 percent of all proven savings,” Cox contends. The Taxibot and the EGTS claim maximum speeds of the order of 20 knots but the runway is only a few minutes away, Cox pointed out. Therefore, he said, he sees high speeds–such as those claimed by his competitors–as a distraction from better ways to save time. In contrast, using WheelTug can significantly shorten the turnaround time, Cox claimed. The elimination of the time to connect and disconnect the tug, and new possibilities like a “twist” maneuver allowing the aircraft to park sideways and thus use two jetways for passenger boarding/deplaning, add up to 20 to 30 minutes per flight, he estimated. The new maneuvers are enabled by the location of the electric drive–on the nosewheel. “The turnaround timesaving is worth 20 times the value of the fuel saving,” Cox said. At a conservative 15 minutes and $150 per minute, the turnaround time saving can be valued at $2,250. Average fuel savings are $100 to $150, Cox said. For his part, Taxibot program director Ran Braier said his product requires no modification or adaptation on the aircraft–except for one cable on the Airbus A320. “We draw no power from the aircraft and we add no weight,” he said. Both the EGTS and WheelTug are targeting short- to medium-haul aircraft, for which the time spent on the ground represents a non-negligible portion of the flight cycle. Therefore, adding a system to improve taxiing may be worth the extra weight that the aircraft has to carry in flight. In contrast, the Taxibot, as it is an external ground system, can be seen as suitable for short-, medium- and long-haul operations. However, it is not as autonomous as it could be, as a safety driver has to stay inside; first, to have rear vision during the pushback and, second, “because the authorities are still conservative and don’t allow autonomous return without a driver,” Braier said. After the pushback, the driver nevertheless hands over control to the pilot inside the cockpit (the Taxibot can be remotely controlled from the flight deck), as the pilot holds responsibility. Indeed, braking by the tug would cause too much fatigue on the nosewheel, whereas the pilot uses the main landing gear to brake. IAI is planning an entry into service for the Taxibot this year. Before that, EASA and then FAA certification should be received. “We are in the final certification test phase for the 737,” Braier said. A record speed of 23 knots was attained during trials on both a fully loaded Airbus A320 and an Boeing 737. “The envelope is entirely open,” said Shuki Eldar, IAI’s v-p for business development. In addition, Lufthansa is to perform an operational test using Taxibot on a revenue flight with passengers on a 737 at Frankfurt Airport in the second half of 2014. The German carrier was to receive three Taxibots by this month. In total, IAI is expected to deliver five to eight units this year. IAI and TLD are marketing their product to airlines, airports and ground handlers. The second system to enter into service might be WheelTug. Cox foresees an STC in 2015. The version to be certified is the second, lighter one (300 pounds for the entire installed system), he explained, after the first version underwent “hundreds of hours” of testing. Neither Airbus nor Boeing is supporting the project but WheelTug can proceed without airframer data, according to Cox. Thirteen airlines, including Icelandair and KLM, have signed up, he said. The system will be installed post-production–as a retrofit in a maintenance facility, for example. Finally, the EGTS is scheduled to be available in 2016 (the company would not clarify whether this was a target date for certification or delivery). It is still in the “concept optimization” phase, Crancée said. EGTS International signed a memorandum of understanding with Airbus in December “to further develop and evaluate” the system for the A320 family. Airbus now refers to the potential option as eTaxi. For all three systems, secondary benefits abound. For example, engine wear may be reduced, ground operations are prone to foreign object damage and the hazard caused by engine blast near the gate is suppressed. However, the challenges are numerous. The extra weight on the nose landing gear may create difficulties to solve when it comes to retraction, while electric motors and hot brakes on the main landing gear may not be good neighbors. And what about, for ground traffic controllers, having aircraft taxiing at different speeds on the same airport, plus tugs driving back to the terminals?